When we look at the QB rankings this season compared to 2014, not a lot has changed. But when it comes to RB’s, I see many people share different opinions. How do we rank Arian Foster after his sports hernia surgery? 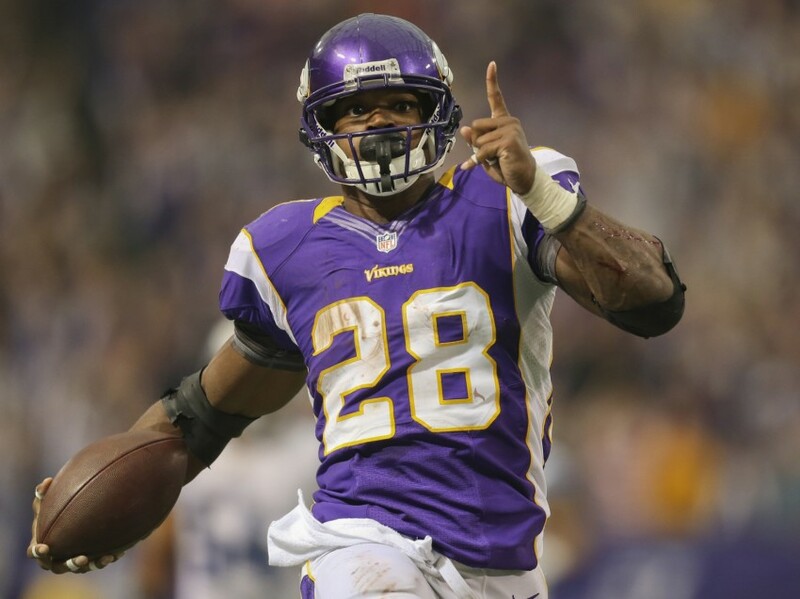 Does Adrian Peterson still have what it takes to be the best RB in the NFL? How much does Le’Veon Bell’s suspension effect his value? Will Demarco Murray repeat his stellar season? Let’s try and sort it out. 1. Adrian Peterson Do you really want to let him slide by you and end up on someone else’s team? I think Rodgers and Peterson are the two best players in the NFL. Some would say 30-years old for a RB is up there, but AP is not your normal specimen. He’s gonna be running like a mad man all season. Mike Zimmer and the Vikings are poised to have him back. All the off the field crap doesn’t even matter. The only thing we care about when it comes to fantasy is how many yards and touchdowns he’ll have. Let’s examine the 2 years he had before he was suspended. His 2012: 2,097 yards 6.0 yards per carry 12 TD’s. His 2013: 1,266 yards 4.5 yards per carry 10 TD’s. You can see he came back down to earth in 2013, but he did only play 14 games compared to 16 in 2012. I think we can expect something in between those 2 seasons. I project him to have 1,750 yards, 12TD’s in 2015. AP has recorded double-digit touchdowns every year since his rookie season in 2007. 2. Le’Veon Bell Bell went on an absolute tear to end 2014, which puts him high on everyone’s draft board. He went so crazy in the 2nd half that he came within 7 points of passing Murray for the most productive fantasy RB of 2014. It all started Week 11 vs. the Titans. He rushed for 204 yards and a score. Then the next week he rushed for 95 yards and a score against the Saints. But he also added 8 receptions for 159 yards that game. His ability to catch the football is what makes him such a valuable commodity. Then the next week he rushed for 185 yards and 2 TD’s, adding 6 receptions for 50 yards and a TD. He finished last season with 83 receptions 854 receiving yards 3 receiving TD’s. His 83 catches would rank him in the top 15 among NFL WR’s. Now that’s impressive. Bell also has added value in PPR leagues. I wouldn’t look to much into the 2 game suspension. You can just plug in your 3rd string RB to hold you over until week 3 when Bell returns. Your season isn’t won or lost by week 3 anyway. The Steelers offense is gonna put up huge numbers this season, you want to be a part of it. 3. Eddie Lacy Lacy is a player who automatically gets added value because of his quarterback. Rodgers opens up the field where teams won’t be stacking the box vs. him. He basically had identical years his first 2 seasons. 2013: 1,178 yards 78.5 Y/G 11TD’s, 2014: 1,139 yards 71.2 Y/G 9TD’s. Lacy obviously doesn’t put up massive yard totals. Only 2 RB’s the past 2 seasons have had 1,400+ rushing yards (McCoy 1,607 in 2013, Murray 1,843 in 2014). Knowing that, you really need to make sure your RB is in position to get goal-line carries. And in a high-powered offense like GB’s, Lacy will get a ton of those opportunities. Lacy ranked third in 2014 behind Murray and Forsett with 38 carries of 10+ yards. I could see him putting up numbers like 1,300 yards 12TD’s. Lacy is only 25 years old and has proved so far that he can stay healthy. I think AP and Lacy will both benefit from Suh leaving the division as well. Hopefully the Packers offensive line won’t get off to a slow start like they did in 2014. You can draft Lacy with a high amount of confidence this season. 4. 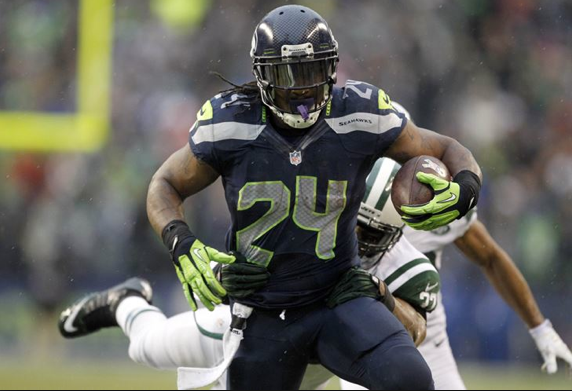 Marshawn Lynch Why didn’t the Seahawks run the ball? Lynch probably asked himself that 1,000 times this offseason. Or maybe he didn’t. He’s already won a SB, he’s the type of guy to smoke a bowl, eat some skittles, and think nothing about it. He’s going to run the rock for the Seahawks with vengeance no matter the story line heading into the season. At 29, he’s still young enough to repeat the kind of seasons he’s been producing. Trade rumors and even early retirement were circling about Lynch until they finally gave him his money earlier this year. The Seahawks showed a possible shift in direction when it traded its best run-blocking offensive linemanc, Max Unger, for Jimmy Graham. Some think Lynch’s value has taken a slight hit with Graham in the mix. I would like to think it will only help. Lynch has been the staple of consistent RB’s over the past 4 seasons. He’s averaged 1,340 rushing 12TD’s since 2011. It was also nice to see him add 4 receiving TD’s last season. He’s what we like to call a “sure thing”. Marshawn has only missed 1 game since 2011. 5. 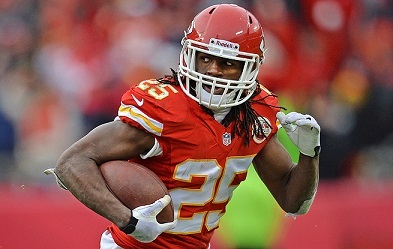 Jamaal Charles Charles came out this offseason and said he wanted to play another 6 seasons. We’ll see how his body holds up, because he sure did disappoint a lot of owners last year. Jamaal’s physical problems last year, included issues with his ankle, foot, back, shoulder, knee and hamstring A handful of teams drafted Charles first overall based on his 2013 performance. He went from 1,980 total yards 19TD’s in 2013, to 1,324 total yards 14TD’s in 2014. One of the major reasons why Charles went off in 2013, is because he had a stellar 70 receptions 693 receiving yards 7 receiving TD’s. Jamaal’s rushing attempts and rushing yards have declined for 3 straight seasons. The good news is Charles hasn’t gone under 5.0 yards a carry in his past 3 years. I think he has some upside at this 5th overall spot. 6. C.J. Anderson The underrated pick out of California grabbed our attention in 2014. Anderson was one of the hottest players to own in the 2nd half of the season. Peyton Manning’s arm began to fade, and the Broncos seemed to hand it to him on every play. Anderson started 7 of the final 8 games and had 767 yards 4.7 YPC 8 TD’s, 33 rec. 290 rec. yards 2 rec. TD’s. C.J. had at least 90 total yards in all but one of those games, and 20+ touches in all but two. A pair of 3 touchdown games helped pad his TD number. Gary Kubiak is gonna run the hell out of the ball this season. Just look what he did for Justin Forsett last season. If he can repeat that kind of performance over 16 games this season, he’s looking like a solid pick. 7. Justin Forsett With the Ray Rice suspension, Forsett burst on the scene as the Ravens feature back. 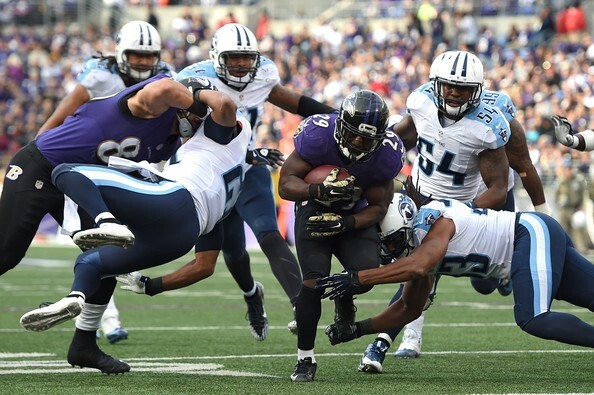 Forsett ran behind one of the best offensive lines in the NFL. He only needed 235 attempts to reach 1,266 yards and 8TD’s. He averaged a stellar 5.4 yards per carry, and led the NFL with 17 rushes of 20 yards or more. After seeing what Forsett could do in 2014, I don’t think the Ravens will take away any carries this coming season . He’s only had 582 carries in his 7-year career so I still think he has more life than your average 29-year old RB. Marc Trestman will also look to get Forsett involved in the passing game. Just look what he did for Forte’s receptions the past 2 seasons. You can feel comfortable drafting Forsett this season. 8. LeSean McCoy McCoy led the league in rushing in 2013 and finished third in 2014. So everybody is curious how this trade will turn out between the Bills and Eagles. Over his past 5 seasons, McCoy has averaged 1,231 rushing yards 395 rec. yards and 10TD’s. He’s shown some real stability by only missing 6 games over those 5 seasons. The elephant in the room with McCoy is how he’ll adjust from a Chip Kelly offense to a Rex Ryan style offense. Ryan has always liked the ground and pound style with his RB’s. One thing’s for sure, the Bills offense will be centered around McCoy in 2015. I don’t see Fred Jackson (34 years old) or Bryce Brown really eating into McCoy’s touches. If either did, it would be Brown, who filled in for McCoy while he was injured in Philly. But I don’t think you would trade for someone so they could split carries with another back. The Bills also helped McCoy by signing a solid FB in Jerome Felton. McCoy shouldn’t disappoint owners in 2015. 9. Jeremy Hill The 2nd round pick out of LSU had a really impressive rookie season. Hill rewarded those who drafted him by finishing 8th overall in rushing last season (1,124 yards). He was also tied for 3rd in rushing TD’s (9), while averaging a solid 5.1 yards per carry. A lot of people will say Hill at 9? But he has to split carries with Bernard. Just look at the production he had even when Bernard had 168 carries. But Bernard will definitely be the featured back on passing downs. The Bengals are gonna run the hell out of the ball again, and I expect Hill to lead the charge. It wouldn’t be crazy to suggest he can have 250 carries in 2015. Let’s see what he can do with them. 10. Matt Forte Even though Forte finished ranking 4th in points among RB’s last season, I have him falling back a little bit in 2015. The departure of Marc Trestman didn’t help either. Plus the Bears will be playing from behind more often than not. Chicago has really leaned on Forte. He has a ton of miles on those legs. For a running back who will 30 this year, 555 carries in the last two seasons is a ton. That doesn’t count the 176 receptions over that time span, either. Forte could prove me wrong in the sense he’s only missed 5 games in his 7 year career. Brandon Marshall being absent will make defenses focus more on Forte also. I think he will still be productive in the highly sought out RB position, but I wouldn’t draft him too early. 11. Demarco Murray In my biggest money league last season, I took Murray 21st overall and was obviously very satisfied. Even as a Cowboys fan I kind of cringed when making the pick, for many reasons. He had fumble issues, he had injury issues, and the Cowboys were awful in 2013. He was rewarded offensive player of the year and had one of the best seasons of any RB in recent history. Murray rushed for 1,843 rushing yards 13 TD’s and had 57 receptions for 416 yards. He just reminded you of the energizer bunny, he just kept going and going and going. A broken hand late in the year didn’t slow him down either. He had 392 rushing attempts, 70 more than McCoy, and 102 more attempts than Le’Veon Bell who finished 2nd and 3rd. That is insane. I don’t care what anyone says, Murray will not lead the NFL in rushing again. Not only is his offensive line a down-grade, his whole offense is a downgrade. The Eagles didn’t sign Ryan Matthews to 3-year $13 Million contract to only give him 5 carries a game. Not to mention third down back Darren Sproles will get his share. The point is, it’s gonna be nearly impossible to repeat his 2014 season. Don’t be the guy who takes him in the first round. 12. Joseph Randle Randle has to be one of the hardest players to give a projection on this season. Let’s examine the things we don’t like about him. He was arrested twice over a 4-month span dating from October 2013 to February 2014. The first time for stealing cologne and boxers from a department store in Frisco, Tx. Which is odd enough really close to my house. One would think an NFL player would be able to afford something like that but, moving on, The second time was him and his baby momma arguing it out in a hotel. She calls the police, they arrive and give Randle a ticket for possession of marijuana. Sounds like a moron, I know. But just think of the upside of this pick if he can stay healthy, and more importantly stay out of trouble. In the small sample we saw out of him last season he rushed 51 times for 343 yards, which is good for a stellar 6.7 yards per carry. But Ryan, he came in when defenses were tired, when the Cowboys had a comfortable league!! Yes some of those carries are of course from those situations. But some weren’t. It seemed like no matter what the game was doing, Randle looked fast, he looked explosive, and looked like a guy who could be a featured back in the future. If you want to draft a guy with tremendous upside and an amazing offensive line, Randle is the RB for you. But just remember, things could come crashing down fairly quickly. Is he worth the risk? I say so. 13. 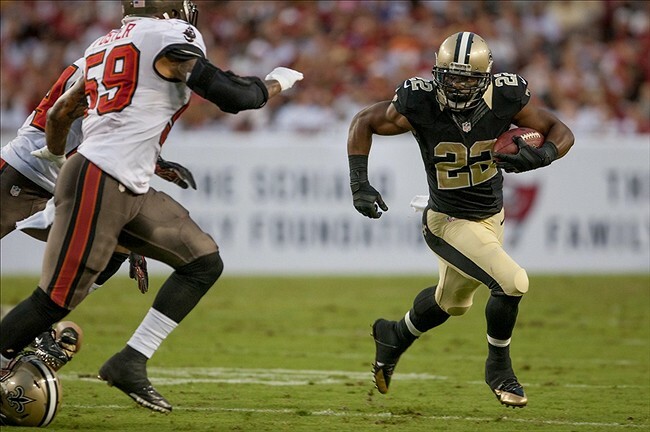 Mark Ingram I think Mark Ingram is one of the most underrated running backs in the NFL. He only played in 13 games last season and still tied for 3rd in rushing TD’s (9). The Saints RB was only 2 days from becoming a free agent when he inked a deal a four-year deal worth $16 Million ($7.6 Guaranteed). The Saints will need all the help they can get now that Jimmy Graham is gone. Even with Graham gone, the Saints are gonna find a way to put up a significant amount of yards like they always do. Brees will keep defenses on their toes, which make things easier for Ingram. Max Unger as the new starting center will definitely help Ingram out as well. The one thing that sticks out to me that could hurt Ingram is the arrival of C.J. Spiller. Coach Payton already likes what he see’s from Spiller in OTA’s and said he is the most explosive player on the team. If Spiller gets red hot or Ingram gets hurt again, his value could fall pretty quickly from 13th RB. Plus he isn’t that great of a catching RB. Overall, I love how he’s 25 years old and I love the progress he’s made in his career. Ingram could be a great option, especially if he starts to fall in your draft. 14. Melvin Gordon I’ll just come and out say it. I think Melvin Gordon is going to win Rookie of the Year. I had mentioned in my QB preview how much I thought Gordon can help Rivers and the Chargers. Early early on I was excited to see many had Gordon getting drafted around 18-20th overall. So I thought my NFL team would have a shot at him. As draft drew near, Gordon’s value seemed to rise each and every day. I think the Chargers made the perfect pick getting him 15th overall. I know he’s in the NFL now but lets just look at what he did in college real quick. He broke all kind of school and national records. He has the FBS record for career avg. per carry (7.79). He ranks 3rd all time in rushing at Wisconsin (4,915 yards), and sixth all-time in Big 10. The former Doak Walker winner was the fastest player in Wisconsin history to reach 1,000 career rushing yards. Gordon had a phenomenal 22 career 100-yard games, which included 19 of 140+ yards, and 7 games of 200+ yards. Here are some knocks on him. He had some fumbles issues, giving up the ball 6 times in his final 5 games. Gordon also had runs of 0 or 1 yard on 20% of his plays, which shows he is more of a finesse back than a power back. He’s gonna need to work on his pass-blocking as well. Danny Woodhead could come in if the coaching staff gets impatient with him during passing situations. I see tons of upside to picking Gordon this season, just don’t jump the gun to early on him. 15. Arian Foster I wasn’t really sure where to put Foster on this list considering his latest injury news. Initial reports had Foster missing 3-6 months with a groin injury. Now they are saying Foster could only miss 4-6 weeks from sports hernia surgery. Some leagues drafting in July did their draft right before the news came out. Then the leagues that have drafted the past week had thought he was going to miss nearly the entire season. Now they are saying he could return as soon as Week 6. That’s just another reason why I don’t like to to my drafts until 2 or 3 preseason games have happened. But just think about the steal you could get if you were able to get Foster in the mid-rounds. We’re talking about a guy who’s scored 65 TD’s his first 72 NFL games. He ranked in the top 5 in points last season finishing with 1,246 yards 8TD’s, 38 rec. 327 rec. yards 5 rec. TD’s. You know if and when he comes back healthy, he is going to be a highly productive back. Problem is, he’s only played 2 full season in his first 6 years in the NFL. How much can we trust this guy? 16. Lamar Miller The 4th round pick out of Miami (FL) rewarded his owners in 2014. He was in the Top 10 in fantasy points, rushing yards, and had scored a total of 9 TD’s. He had a better year than LeSean McCoy, Alfred Morris, and Jeremy Hill just to name a few. 5.1% of Lamar’s carries went for at least 15+ yards, which was right along with Bell, Hill and Matt Forte. I wouldn’t worry about Miller losing his carries to anyone going into 2015. The Dolphins did spend a 5th round pick on Boise State RB Jay Ajayi, but they won’t be giving him a substantial amount of carries this season. The Dolphins got rid of cry baby quitter Mike Wallace, added Kenny Stills, Greg Jennings and Jordan Cameron. It looks like the Dolphins are trying to make a decent run out of 2015 and their offense shouldn’t be to shabby. There is just no hype around Miller, no excitement. But don’t be fooled into thinking he can’t help your team because he’s not a big name player. He could fall to you in the middle rounds or mid-late rounds, which would be a great spot to grab him. 18. Frank Gore When running backs hit 32-years old, if they are still around, you usually don’t expect to much out of them. I think that will be different for Gore this season as he looks to get comfortable with his new team in Indy. The good news is he has Andrew Luck as his QB and he’s on a team that expects to win. The Colts don’t have as good of an offensive line as the Niners do though. That might be the only negative thing I can think about with Gore’s new situation. Frank has been the model of consistency since his rookie year in 2005. He’s averaged 1,107 rushing yards over his 10 year career. 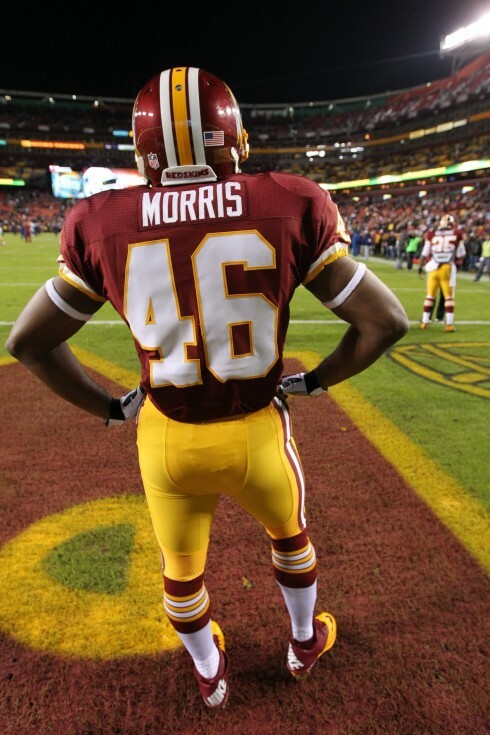 Gore has also been an iron man lately, playing in all 16 games for the 4th season in a row. So you can’t really say he’s gotten to old, or his too injury-prone. Hopefully Gore can recreate some of his early magic (2006-2010) in the passing game with Luck. His reception numbers have seemed to fade away the past 4 seasons. He should also have the job secure for the majority amount of the carries. We’ll see what the former 3rd round pick can do in his first season away from the only home he’s ever known. I think he should be fine. 19. Joique Bell Be sure to check on the health status of Bell as the season approaches. Right now he is missing the preseason due to surgeries he’s had on his achilles and knee. Bell is really hoping he’s healthy after the departure of Reggie Bush this offseason. It was looking like he would take over the majority of the offense from behind the quarterback. So we will place him at this top 20 rank assuming he will be playing Week 1. If he is a no go, be sure to grab second round pick out of Nebraska Ameer Abdullah in the meantime if you draft Bell. Joique finished 14th overall in fantasy points among RB’s, with 860 yards 7 TD’s, 34 rec. 322 rec. yards 1 rec. TD. With the Lions offense trying to get back on track this season, it doesn’t hurt he will be surrounded by Stafford and Megatron. Bell could be a steal if he ends up being healthy and Abdullah doesn’t eat into his carries. 20. Carlos Hyde Sometimes in the NFL, it’s not always about how good you are, it’s about the opportunities you get. Carlos Hyde looks to have every opportunity to become the Niners lead back this season. Hyde rushed for 333 yards 4 TD’s in his rookie campaign of 2014. Hyde will need to stay on his game if he wants to take control of the starting position over Kendall Hunter. But I don’t think the Niners spent a 2nd round pick on Hyde for him to split the carries with someone. I thought it was a great pick by the 49ers 2 years ago, Hyde was a stud for Ohio State. Even though there is nothing to like about the Niners as far as fantasy this season, Carlos could become a bright spot on a team that is looking for anything positive.